Do you find yourself struggling to get blog posts written? I know that I do! I have a ton of content ideas to write about but yet it seems to be where I struggle the most! Sometimes it is hard to stay focused on your blog. I know some bloggers excel in writing blog post but then struggle with the rest of blogging. Me, I can get lost in the busy work. It makes me feel like I am accomplishing more. If I spend all day writing blog posts I feel like I didn’t get as much done as I could have if I would have done other less time-consuming things. I know that is dead wrong. Writing blog posts is the most important part! You could have a dull and ugly blog but have amazing content and that is going to do much better than a beautiful blog with no blog posts! So if you are like me and this is a struggle for you then I am here to help. I am challenging you (like I am challenging myself) to put writing first! I will think about these amazing things to write about and how I can help my readers but for some reason once I think it then I check it off my mental to-do list. Or if I don’t have the perfect writing environment then I find excuses to not write. When in reality I know that if I have a spare moment I need to write a blog post. I need to be getting all these ideas and information down on paper and put to use. Even if I have to write it on a blank piece of paper or in my journal at the park. I need to just do it! I will tell myself that it is a waste of time to write it all down and then have to retype it later. But doing that would still be better than not doing anything at all! I find myself sitting down and logging into my blog, checking my emails, my blog stats, my social media accounts and then I think okay I’m done. When did I really accomplish anything? Nope! The most important factors of blogging are to write amazing helpful content and to promote it! If you need some motivation just go check out some other amazing blogs. What really helps is to check out the same one a couple months later. You will see all the new amazing content they have added and realize wow I am slacking! I love to check out A Modern Homestead. I came across her ebook Blogging at Any Level. This was a great read for me. 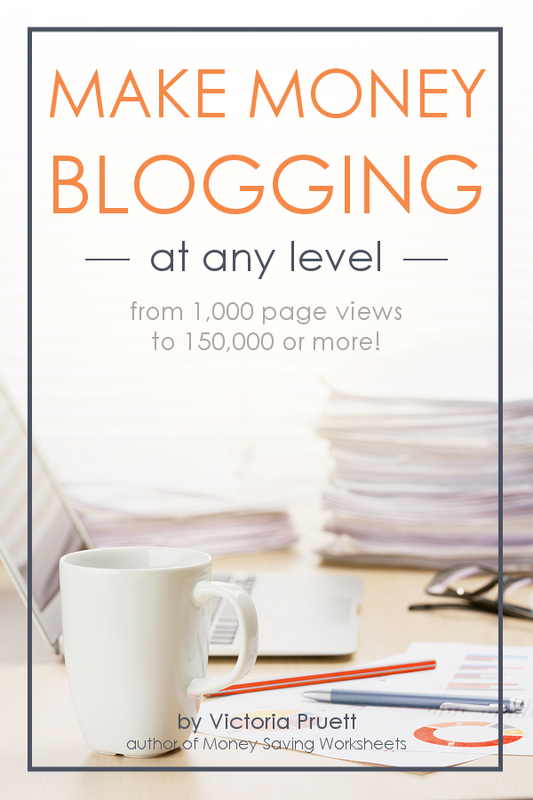 Victoria is a blogger who doesn’t have a blog about “how to blog” but yet she wrote an ebook to help her readers see how she started and grew her blog. This gave me a different perspective from the same group of people teaching you how to blog that I usually follow. She has a blog that teaches you how to homestead. She started a blog sharing what she does to live a homestead life and, after making money and having a successful blog, she wrote an ebook teaching others who want to do the same! I hadn’t been on her blog in a while and when I went back it was full of all kinds of new videos and information! It was very inspiring to show how important it is to keep adding content! If you have a business and all you have is one item in your store then the odds of you making a sale aren’t very good. But if you have a store like let’s say WalMart or Target that is full of all kinds of different products then people can’t help but buy something! We all do it, we go in for one thing and come out with 10 things! And usually, we forget the one item we went there for to being with! It is important to make time to write blog posts for your blog. To me, it seems like the longest part of blogging. You can commit to making little changes, posting things on social media, watching tutorials, but again none of those help you if you don’t have a “product”(blog post) in your store(blog). So to think about sitting down and writing for 30 minutes, to an hour, or even 3 hours, it all seems like a big chunk of time to give up. It is a must and the most important, so make time! If you map out your day then you can find time to make that time commitment. Maybe you work all day so it is easier for you to write in the evenings. Maybe you are an early bird and you need to wake up before work and write. Maybe you have downtime at work or maybe you are stuck in traffic and you can record a video while sitting in traffic! No matter how you find the time it needs to happen. Set a schedule for yourself once you have found your ideal writing time. If you have found the mornings work better for you then set your schedule that you are going to set 30-45 minutes every morning to write. If it takes you longer than that to write one post then that’s okay you are not alone. That is why you now have scheduled that time for writing. You have the next day to finish it up. No one expects you to finish one blog post a day at first but if you get into the rhythm of writing every day at that time then you can for sure have one done a week! Once you are done with writing your post for that week you can use that time to write emails or start on the next blog post and be ahead of the game! Because you never know when life is going to get in the way and you don’t have the time to write for a few days. Here is another big one for me. I am easily distracted! If my Apple Watch goes off and shows I have a notification I catch myself checking it right then. I will be in the middle of writing and I will stop and check it. I am horrible about having the T.V. being a distraction. Usually, I don’t have it on at all or it will distract me. I do better work in complete silence. So, if you are like me and get distracted. Shut off your notifications and turn off your T.V. and get to writing! Commit to yourself and your readers. There are a million excuses we can come up with. There are so many other things that need to be done all the time. There is a pile of dishes that magically reappear every time I do them, there is always a load of laundry going, the dogs constantly want in and out, and when you do stop to take a break you walk past a hundred other things that need to be done. Unfortunately, those things are going to just reappear the second you finish them. I have a hard time focusing when there are chores to be done. So I had told myself that I will do my chores first so I could focus on work. Well, it was a good theory but it didn’t work. As a mother, you may have guessed why…because as a mother, our chores are never done! As soon as I thought I was at a good stopping point I would come across something else. Finally, I would just say okay that is enough I need to work. I would sit down and try and write for just a little bit before the bus would come. I felt like I was just getting a good rhythm going and I would have to stop to go pick up my daughter off the bus. Then it was time to cook supper and everyone knows what happens after supper. More chores! After just getting the kitchen all cleaned it lasted only a few hours and I only got a little bit of work done. So, now I have decided that the chores are just going to have to wait. I may throw a load of laundry in or start the dishwasher but that’s all. Then they can be running and be done when I am done working. I have decided that I will work in the morning and then do chores in the afternoon. This way work is for sure done and if I don’t get my chores done then it won’t even be noticeable to anyone because as soon as everyone comes home the house gets all messed up right away anyways! When you do find your time to work and you are ready to write. Clear your mind. Focus only on that post you are writing. Again, it is easy to get distracted and your mind will start to wonder. The next thing you know you are thinking about what you need to buy at the grocery store or that you need to schedule the kids’ dentists appointments. Try and clear your mind and think about your reader. Think about how this post will help them. How it can make life easier for them. Okay now that you have decided on when you are going to work on writing blog posts and you aren’t going to let anything get in your way it is time to get to work! You will either find a way or find an excuse. It is much easier to find an excuse (TRUST ME!) but that is not going to get you anywhere! For me, it is easier to say well I have all these chores that need to be done. But this blog is also important to me and I want it to be a success! So those chores will be there later! Whatever your excuse is don’t let it hold you back! Here is a blog post outline printable to help you write your posts easier! I have a fairly new blog and it feels like I’m doing a bunch of things like Pinterest and checking stats and researching but no time to actually write! I’m definitely going to try and put time aside specifically for writing! Thank you! Hey Taylor! Yes, we are all guilty of it at times but I have learned that it is more important to produce content than do busy work. However, that being said, I am still guilty of doing this myself! I have so many blog post ideas I just need to get them all out there! Thanks for the comment!